The conclusion of the LJC is only advisory but I doubt that there will be moves to ban HGV traffic from the bridge in the near future. The mood of the meeting was that the recent closure was a rare event caused by bad driving. The consensus was that the bridge is safe for long and heavy vehicles. The main problem with banning HGVs from crossing Ludford Bridge is that the heavy traffic will be diverted elsewhere across the town. We are not expecting that many banned vehicles will find their way across Dinham Bridge, as the one pictured above did doing the recent closure. 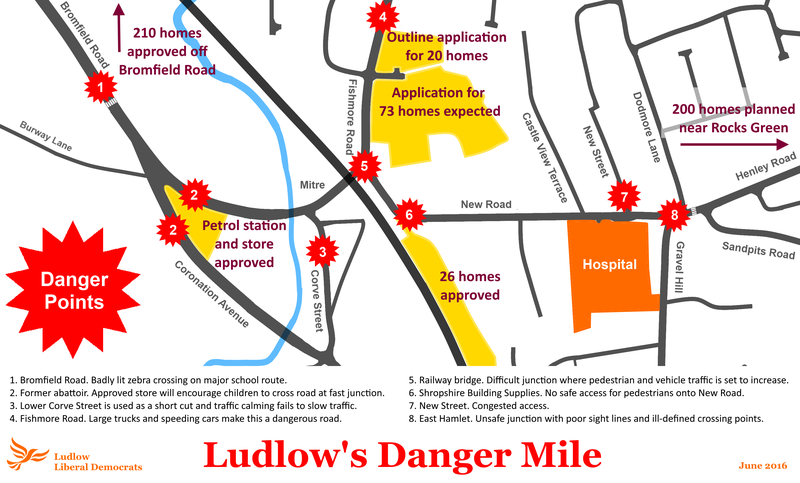 As councillors, our main concern is that HGVs would be diverted across the One Stop junction near Ludlow Hospital. This is already recognised to be a dangerous junction, with a risk of children or elderly people being injured or killed. It is on our “danger mile” map. The mood of the meeting on Thursday, and the views of Ludlow unitary councillors and Shropshire Council’s highways experts, is that an HGV ban will create more damage than it would resolve. This does not concur with the view of Ludford parish council, which wants a ban. It says HGVs should use the Bromfield Road junction with the A49. More than 90% of you who voted in my online poll wanted a ban. The long term solution would be for Shropshire Council to install a roundabout at the north approach to Ludlow on the A49 to enable HGV’s to access Ludlow without negotiating the corner in Upper Galdeford. I would urge you to consider working with the Department of Transport to limit Ludford and Dinham bridges in Ludlow to non HGV traffic. There are alternative routes into the town, as the current bridge closure has shown, which would be more appropriate for large vehicles and help protect out historic bridges. If Ludford and Ludlow councils and Philip Dunne had attended the LJC meeting, all were otherwise engaged, they would have heard clearly balanced arguments on why an HGV ban is simply impractical. The presentation by highways expert Glyn Shaw, pointed out the difficulties and dangers that would be created by chocking off access for long and heavy vehicles to Ludford Bridge. The engineers at the meeting confirmed that the bridge can carry 40 tonnes weight and can accommodate the length of HGVs. But these must be driven with care, as must any vehicle on a road, particularly in a historic town like ours. The problem we faced earlier in the year was one of stupid driving. It appears the truck driver was unfamiliar with our town and was following satnav on the way to Tesco to deliver a load of tarmac. Finding that you can’t get a truck through the Broadgate, he reversed back to the bridge, hitting it as he turned. His insurers are expected to pay the £75,000 repair costs. There have been only two other incidents since 2003 where the bridge has required repairs after vehicle damage, according to information supplied to Ludford parish council. The two repairs in 2007 and 2008 cost a total of £2,044. In the winter of 2011, damage to the bridge was extensive. The bridge was closed for three months and the repairs cost £111,000. This damage was primarily caused by severe weather. During the recent closure, there were problems getting the right diversion and information signs in place. To prepare for any future closure of any of the four main roads into Ludlow, we’ll be drawing up an agreed signage plan with Shropshire Council, Ludlow town council, Ludford parish council and the Chamber of Commerce. We will also draw up a communications plan to ensure that we get the message out loud and clear that Ludlow is open for business, should future road closures occur. Finally, we will look at sources of stone to ensure that we can get enough to ensure that the historic fabric of this town in kept in good repair. This is likely to form part of a Heritage Partnership Agreement that is being negotiated between Shropshire Council and Historic England. Traffic calming techniques could help if high enough for no vehicle will go fast if he thinks his suspension will be wrecked Well lit and warning lights might make people aware of the zebras.Could no.6 have a small pedestrian bridge? No.8 would flashing warning lights and road signs do any good? The real issue here Nigel is the historic context. We can put in a lot of signage and lights but that will wreck one of the best historic streetscapes in Britain. Damage to this bridge is rare. But the episode has shown how we need to be better prepared for future road closures of any sort.